When you are sitting in jail in Martinsville, your goal is to get out as soon as you can. When a judge gives you the option of posting bail, you might feel relief. That is, until you see the cost your bail. Many bail amounts are set in the thousands of dollars, far beyond the price that the average person can afford. At this point, you might find yourself realizing that getting a bail bond company to assist you is your best choice. Here at Affordable Bail Bonding, we make it simple and efficient to post bail. When you need a bail bond company in Martinsville you can trust, we hope you will pick us. We offer fast and reliable bail bonds that are aimed at getting you home as quickly as possible. So how do you choose the right bail bond company in Martinsville? Check out these five signs that you are working with the right team. First and foremost, a good bail bond company should treat you with respect. From the moment you first call in, whether you are reaching out on behalf of a loved one or for yourself, the bail bondsman should handle the situation respectfully. Being arrested is in no way fun. The last thing you need is for people to pass judgment on you or treat you with less than kindness. A good bail bond company isn’t there to act as your judge or jury. They are there to help you during your time of need and they should do so respectfully. Being stuck in jail is not a treat. You want to spend as little time as possible locked up. For this reason, a good bail bond company should be working diligently to make your release as quick as possible. Your time should be their number one priority. If you feel like your bail bondsman is not taking your time seriously, look elsewhere. While there are certain aspects of being released from jail that are out of your bail bondsman’s hands, they can do their best to work efficiently. Don’t settle for a company who operates slowly and doesn’t seem to care how long you spend behind bars. A quality bail bonds team will ensure that bail is affordable for all. Bail amounts are often set too high for the average person to afford. A bail bond allows you to simply pay a percentage of the bail amount — generally, around 10 percent of the bail — and the bail bond company posts the rest. However, in some cases, you can’t afford this percentage either. When this occurs, it is vital that your bail bond company offers other methods for financing. Opt for a company who strives to give you the best chance possible to post bail. When you work with a quality bail bonds team, they will do their very best to put your mind at ease. This is particularly true when you are calling on behalf of a loved one. It is normal to have fears about how your family member or friend is doing in jail and is common to feel completely at a loss for what to do. When you have a quality bail bondsman on your side, you should feel far less stress. A quality team will work hard to alleviate all your worries. They will answer questions, keep you in the loop, and work hard to get you or your loved one out of jail. Work with a team who helps you feel less stress. Finally, the right bail bondsman in Martinsville will always be on call. You don’t choose when an arrest happens, which means you don’t choose when you need bail. A bail bondsman should be ready to assist you no matter what hour of the day. Opt for a company with 24/7 availability. 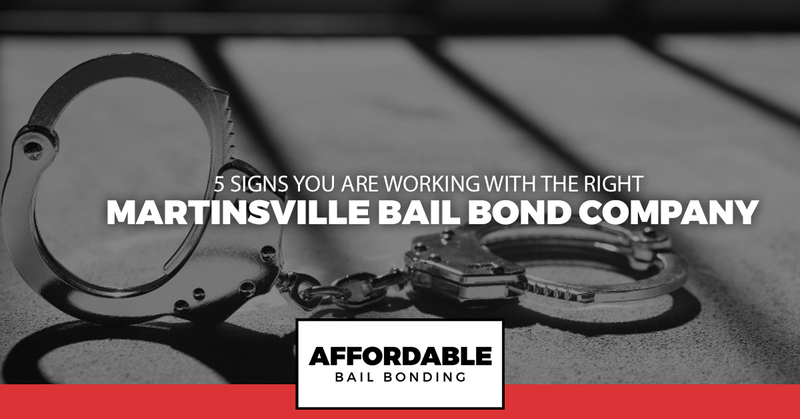 If you are looking for the right bail bondsman in Martinsville, reach out to our team at Affordable Bail Bonding. We provide outstanding bail services and we strive to offer you the very best customer service possible. We understand that needing bail isn’t an ideal situation, which is why our goal is to make it the best scenario we can. Contact us night or day.